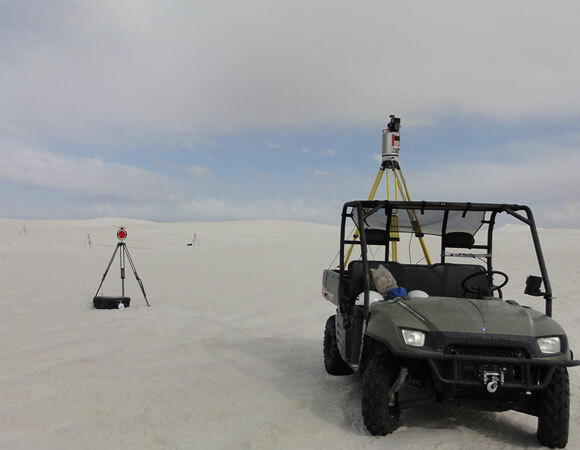 UNAVCO provided support for Dr. Ryan Ewing's (University of Alabama) first TLS survey campaign to the White Sands National Monument. Scanning was carried out over the course of four days in three separate locations within the monument. 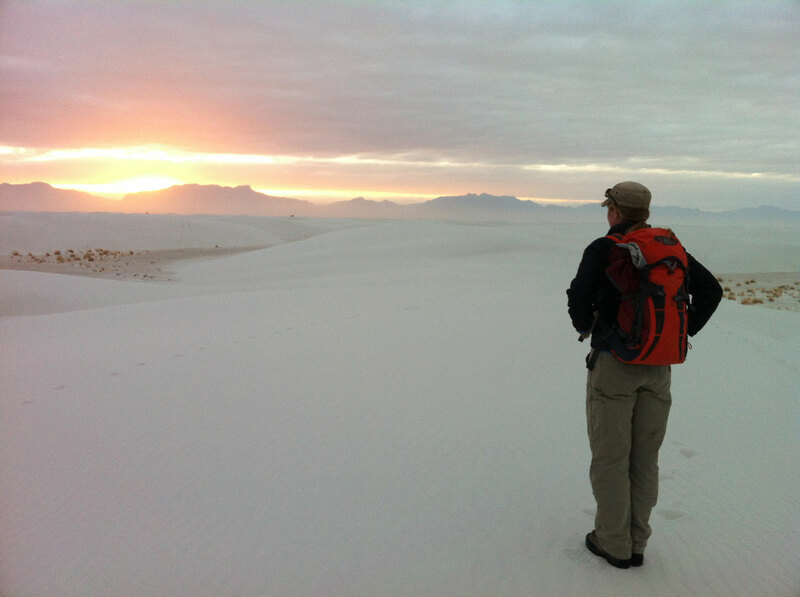 Site access and project assistance were made possible by Dr. Ewing's ongoing collaborator, David Bustos, White Sand's Chief of Resource Management. 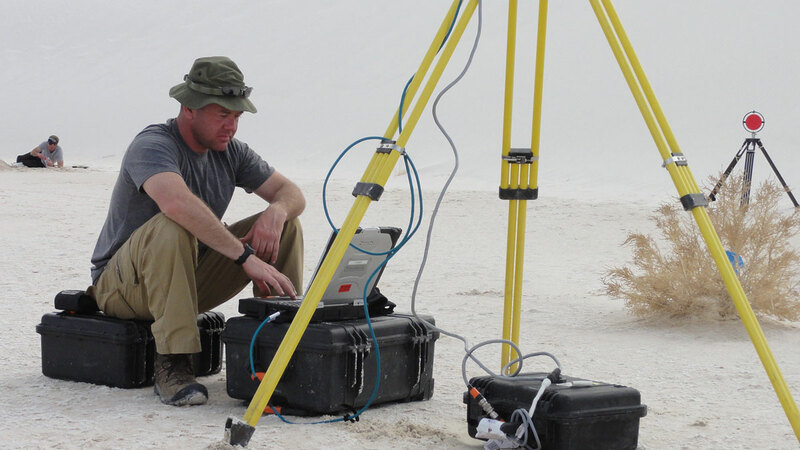 Dr. Ewing uses geospatial, remote sensing, and field data to understand sediment dynamics in modern landscapes as well as within the sedimentary rock record. 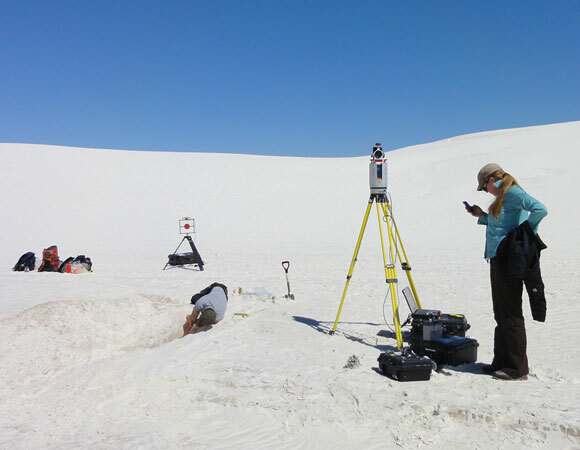 His project at White Sands is multidisciplinary and is in collaboration with researchers from the University of Texas and Penn State University. 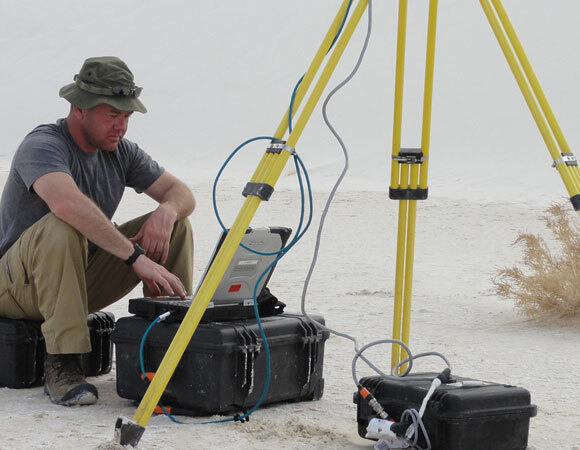 Ewing is using airborne and terrestrial LiDAR, high resolution aerial photography, as well as peizometer and weather station data to study sediment transport, dune formation, aeolian stratigraphy, and recent regional climatic variations. The primary goal of the UNAVCO supported field campaign was to capture the surface topography of a 500m E/W trending dune transect before and after a wind event to compare the changes. 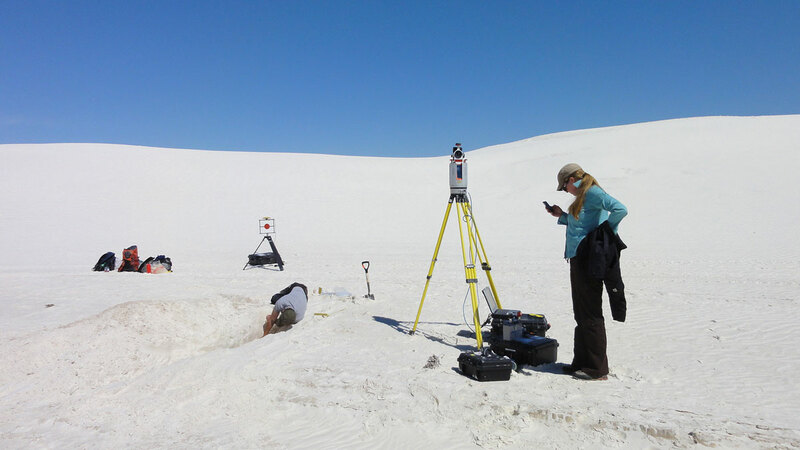 The transect was located in the transitional zone on the periphery of the main dune field in White Sands. Figure 1. 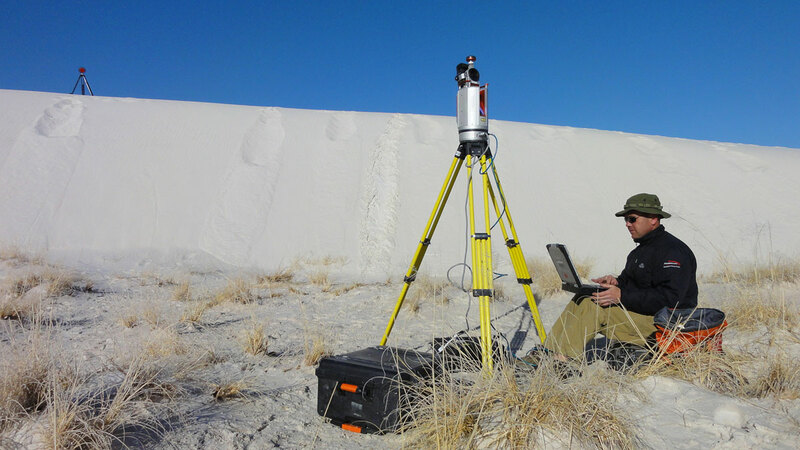 UNAVCO Engineer Abe Morrison operates the Reigl VZ400 scanner in an interdune area. Ryan Ewing gathers sand samples from a trench in the background. Photo by Sarah Doelger. Figure 2. 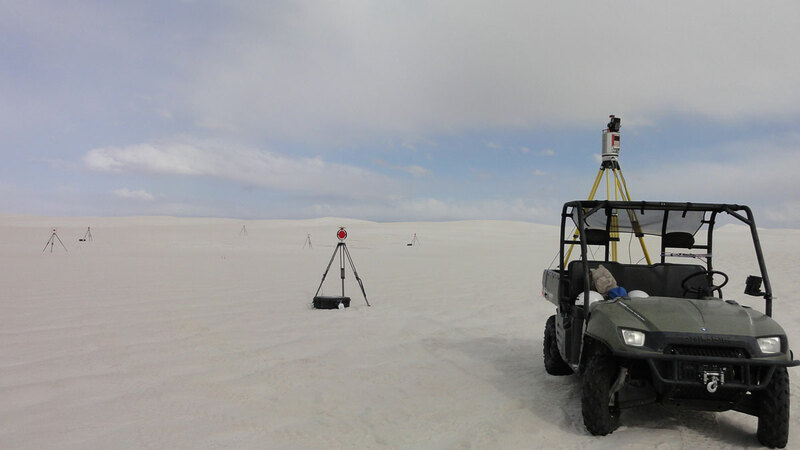 The ATV provided by White Sands National Monument was used at the transect field site to elevate the scanner above the desert floor in order to eliminate shadows in the point clouds. Photo by Sarah Doelger. Figure 3. Artificially generated sand avalanches are pictured in the background. Before and after scans were taken of each slide. Photo by Sarah Doelger. Figure 4. 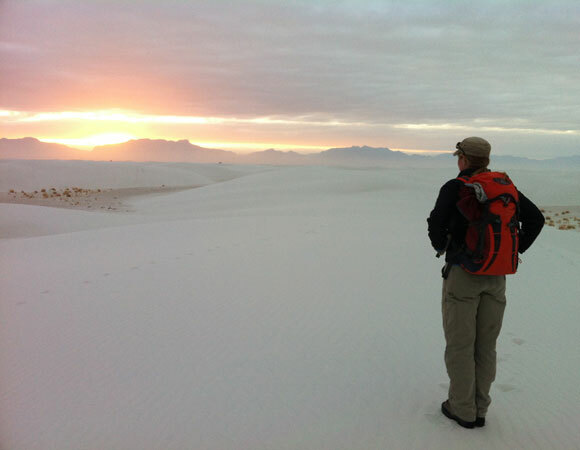 UNAVCO Engineer Sarah Doelger admires a sunset over the White Sands National Monument during a return hike from the TLS project area. Photo by Abe Morrison. Figure 5. UNAVCO Engineer Sarah Doelger prepares to use the Reigl VZ400 to scan a hand dug trench wall, while project PI Ryan Ewing collects samples. Photo by Abe Morrison. Logistics proved to be challenging. Park ATVs and personnel were necessary to transport the equipment to the field site, but were only available for two of the four days. In total, one 250 m transect was scanned at cm resolution. 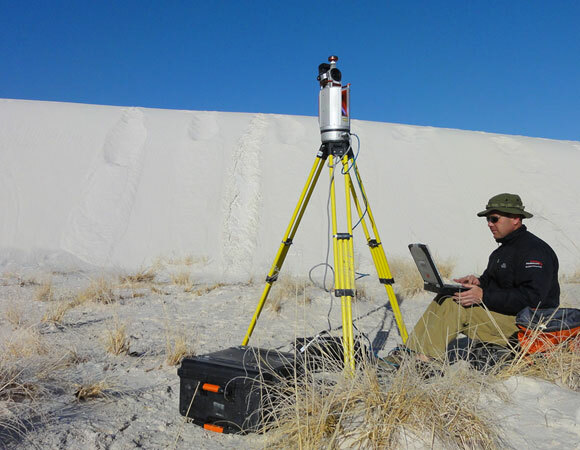 The remaining two days were used to scan localized dune avalanches and the stratigraphy of ~ 2-3 ft deep interdune trenches. The third day of scanning was cut short by ongoing afternoon rainfall.